Travel back in time and explore the resort and decide if the Classic Years or the Legendary Years is the building for you! Check out the menu for the Everything Pop Food Court and browse the drink selection at Petals Pool Bar. There are activities galore at Pop Century Resort! Shopping, playing at the Fast Forward Arcade or challenge someone to a ping pong game! Spend the day pool hopping and choose from the Bowling Pin Pool, the Computer Pool or the main Hippy Dippy Pool! 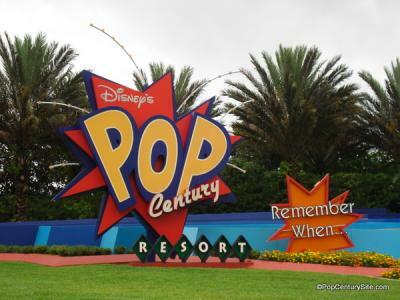 Discover more and hundreds of pictures at the Pop Century Resort Site!